← When God Fired His Gun! I will never forget the day in 1970 when I acquired the wreck of a 1934 Alvis Speed 20 car. It was already 36 years old and in an unbelievably impossible condition. Most sensible people would have consigned it to the scrap heap without any hesitation! The problem is that emotions can have a nasty habit of clouding one’s judgement, so that anything but sensible decisions are made! The truth was, I had fallen in love with the dream of owning an Alvis Speed 20. So, when I acquired the wreck, I didn’t see the sad remains of a hopeless case, I saw in my mind both the gleaming beauty that had left the Alvis factory in 1934 and what the car would look like when I had fully restored it to its former glory. The magnitude and near impossibility of the task that lay ahead of me never entered my head – all I could see was the restored car and enjoy driving it in my dreams. It was in those precious moments, that in a few seconds of earthly time I caught a glimpse of timeless eternity. I saw things that I’m still unpacking. I saw into the heart of God and with His eyes I looked at the wrecks of broken lives – hundreds of them, thousands and millions of them. And there on the sidelines was Satan grinning over the lives he had wrecked and which he was wanting to send to the scrap-heap, without hope. As I looked I sensed the joy there had been in God, when each life had been created in all its pristine beauty. But then I saw His tears at the wrecks that so many of these people had become. Finally, however, I became aware of the joy that would be His, if those broken lives could be restored as their maker had intended them to be, and for which His Son had died. The thrill I have had in restoring the car, is nothing compared with the thrill there is in the heart of God when he sees one of His children restored in His image and likeness. The healing ministry is not, intrinsically, about making people feel better so they can carry on living self-centred lives, it’s about the restoration of God’s order in their lives so that they can live in the destiny God prepared for them in advance – and which the enemy has so assiduously tried to rob them of. 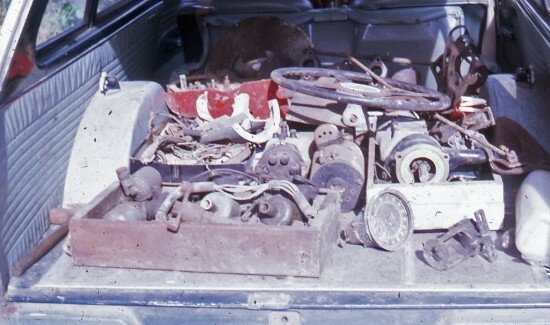 God was right, I could restore that broken car, but it’s taken me forty two years to do it! Forty years longer than my longest initial estimate, during which God has been doing the work of restoring thousands of broken lives. And in those forty two years I’ve driven that car thousands of trouble-free miles in my dreams! But later this year, when the car’s finished and the dream has become reality, I intend to drive it to all our UK Centres and across the Channel to our Dutch Centre as well. The car has been restored to run and so I will be conducting a new training course at each centre, simply called Restored to Run – because that’s what God wants to do with each one of our lives, restore them so we are able to run the race of life. 5 Responses to Restored to Run! Very touched by the video. I remember hearing the story of how Peter gave up on car restoration to pursue the vision for Ellel. That was told to me secondhand so I don’t know if the details are quite right. At the risk of sounding a bit heretical, and as someone who can watch old sports cars all day long at car rallies, it always struck me as a bit of a shame that a lovely old Alvis never got to be restored. Not that I would have had the patience – or the ability – to do it! What did God do next? He rested. I don’t think He rested because He was tired. I think he rested because He wanted to enjoy what He had created. He looked at what He had created and He wanted a whole day just to appreciate what He had made. Because we are so used to thinking of ourselves in our damaged state, we may never have realised that isn’t the way God ever wanted to see us. When he looks at us in our restored state, what He sees is very good. What He sees is something that He really wants to appreciate and enjoy. Worth a whole day off! It has been a long time since you and Ellel started the restoration of my life. I am happy to report that healing and growth have continued and I am continuing to minister healing and deliverance at my local Anglican Church in Falls Church, VA. The blog and video touched me deeply with the evidence of a few tears. Thank you for teaching us the importance and blessing of being part of God’s restoration process in other’s lives. It is just awesome to see Him work. Do you still have the picture of Jesus holding the lamb? Restored to Run! Wow! Just like me on the Ellel 365 course! I just half to share this picture Our Lord gave me. I saw an exit to a rather black tunnel and as I watch your car with you at the wheel came out followed by many people. Torn and broken people. I saw this repeated time after time and always different people followed you an your car out of the tunnels. Sometimes I get words with these visions but not this time!